Basic Idea: Golden should scale back its expensive opposition to the Jefferson Parkway, and move to a more reactive stance if future traffic increases or other projects in our area are proposed. Below are the Pros and Cons as offered by City Staff, and below that, comments from the public collected at the two Transportation Open Houses held by the City on September 24th and 26th. Would immediately result in significant savings to Golden. By turning the focus away from Golden, it may expose the flaws and weakness of Jefferson Parkway. Could make it easier to construct Jefferson Parkway. Could make it harder to mobilize opposition to future unwanted transportation projects in our area. Could result in worst-case scenario of increased traffic and no improvements or mitigation around Golden. Quit fighting it – let’s get on with it save money and time. In my opinion, the money spent fighting this fight would have paid for the road! I don’t think it should be a toll road but must be built SOON! Nope — Keep up the pressure. Money spent to define what we want and what will be built is the best money spent! Relative to how it will define our community for a lifetime, it is a small and valuable investment. Continue the fight, do not leave it to others to choose for us. Keep up our property values by REQUIRING the full Muller Plan. Anything less is unacceptable. How much are we actually spending? At the Transportation Open House meetings, each alternative was posted, and attendees were invited to vote with star and circle stickers on the alternatives they liked and disliked. Below is a tally of those votes from both meetings. 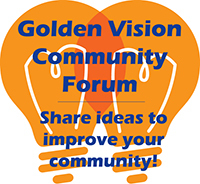 On the Golden Vision Community Forum, the public also had an opportunity to vote for the option they liked best – this option received 1 vote.